How Will Bariatric Procedures Affect Your Eating Habits? With readily available junk food and superbly busy lifestyles – not to mention the superstore grocery centres that sell your favorite foods in bulk – it is increasingly more difficult to lose weight AND keep it off. To make the situation of weight gain worse, many of us do not begin to realise we are steadily putting on a lot more weight until quite late in the ‘cycle’ of gaining. It seems that suddenly nothing in our wardrobe fits us anymore, including our largest size slacks. We look at the scale and panic. Wanting to let go of the excess weight as quickly as we can goes through our minds. IF not our own minds, then the minds of our General Practitioners or Endocrinologist, who may remind us of the detrimental health repercussions of being overweight. Why is being over weight such a common issue in Australia society? The answer is many reasons, but all intertwined. Firstly, we live busier than ever lives, including working far too many hours or running the kids around from event to event. Then there’s the sugar-laden soft drinks and junk-food/fast-food availability on every corner. With fast food chains and snack manufacturers using secret ingredients and lots of sugar into tricking our minds into wanting MORE MORE MORE, it’s no wonder there’s a national epidemic of obesity at our door. With the newest ‘weight loss’ medication still years away from being workable with no side effects, it can be a tough go to lose the excess weight once it’s solidly distributed around, and on, your body frame. As we all know, it’s not nearly as easy to lose weight as it is to gain weight. Plus, our busy lifestyles and eating habits aren’t exactly helping. Once we get to a certain super-sized, unhealthy Body Mass Index (BMI), we can also find that our joints don’t safely allow our bodies to exercise without pain or risk to our ligaments and joints. So despite exercising and eating as healthily as they can – no amount of dieting seems to help these individuals lose the excess weight. They’ve also likely gotten to the stage that their intake capacity (stomach size) is able to consume far more calories than they could ever hope to burn off through activity or normal metabolism functions – no matter how much or how long they exercised. We all know that living with obesity is dangerous to health and longevity, but we also recognise that dieting adversely impacts our health and often leads to further weight gain when we go back to eating normally, due to extreme diets impacts on our organs and our metabolism. Even if temporarily successful, extreme diets are also unlikely to keep the weight off of your body over a longer period of time. In such a scenario where your weight, BMI and your waist measurements are at a dangerous HIGH – your GP or Endocrinologist or Surgeon may recommend weight loss surgery. The more common weight loss surgeries (known as Bariatric Surgery) include the Gastric Sleeve, the Gastric Band, a Gastric Bypass procedure or a Lap Band procedure. 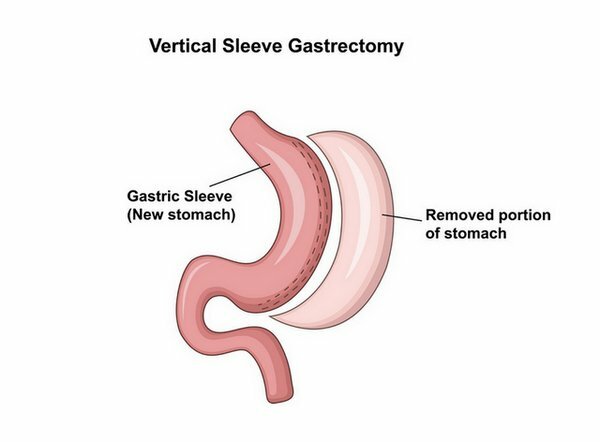 What is a Gastric Sleeve Surgery? This helps you lose weight by limiting how much food you can comfortably and safely consume. After your stomach is reduced, your appetite is also reduced, which can help you better control your eating or food cravings (but not totally – you’ll still need to do a lot of work and maintain a very different lifestyle to keep your results and get healthy – it just might give you a bit more help than if you tried to do so without the surgery). With a reduced stomach size, you’ll feel fuller, faster too -which often helps reduce your food intake and reduces your everyday calorie consumption. Gastric Sleeve Surgery is gaining as an effective option for helping obese or severely overweight people to lose weight and overcome obesity. Unlike the lap band, no adjustments are needed with a Gastric Sleeve Procedure. Plus, it appears that you’ll be able to lose more weight with a Gastric Sleeve procedure compared to a Lap Band or a Gastric Bypass. If you choose to have this surgery, your Specialist Bariatric Surgeon (Obesity Surgery Specialist) will give you details. He or she will also advise you of the potential complications and risks of having this surgery, as well as special dietary measures you’ll need to take to maintain results and overall health. You are likely be advised by your Bariatric Surgeon to undertake special eating habits to shrink the size of your liver before surgery. That’s because an enlarged liver can increase the complications in your surgery. Eating differently BEFORE your Gastric Sleeve Surgery not only helps to leave you healthier, it also helps you prepare for an altered diet that you will need to adhere to AFTER your gastric surgery procedure. In your pre-surgery and post-surgery Gastric Band eating plan, you’ll likely be told to consume a bit more protein and less carbohydrates than your normal eating regime. This change alone can help you lose a bit of weight and re-adjust your appetite. Your may be advised to undergo a strictly liquid diet at least two days prior to your surgery day. Your Bariatric Surgeon and Care Team will give you specific instructions for the months, weeks and days before your surgery. So if you’re considering this option, be sure to book a consultation with your chosen Bariatric Surgeon as soon as you know you’re wanting the surgery to best prepare yourself for a Gastric Sleeve. In the time following your gastric sleeve surgery, you’ll need to take utmost care of your eating routines and follow YOUR Surgeon’s specific advise (most Surgeons will also link you up with a nutritional counselor). Week One after Gastric Sleeve – what can you eat? The information below is of a general nature and is not intended as advice. NOR is it a substitute for the medical information and pre and post-op recommendations provided to you by your GP and your Gastric Surgeon. In general, if you’re about to have Gastric Sleeve surgery, here’s what to expect (with modifications as per your Surgeon or particular health needs). In the first week after your gastric sleeve surgery, you may be allowed to take in ONLY clear liquids such as water, fresh juices, soups and broths. Avoid any carbonated beverages or other drinks with added sugars. Typically, you’ll be advised to take small sips, and to take these liquids in very slowly. You WON’T be able to eat fruits and vegetables although you might be able to squeeze fresh fruit juice into your water – ask your Surgeon (no pulp though typically)! Check with your Surgeon as they might NOT be permitted for you or in relation to your specific procedure. Once you’re readily able to tolerate liquids, your Surgeon will advise you when you can advance to the next stage of eating changes (pureed foods). During the second week, you may typically take in foods in their pureed form. These may include mashed potatoes, low-fat cottage cheese, sugar-free yogurt, soup with blenderized vegetables and hot watery oatmeal. Ask what pureed vegetables you are – or aren’t – allowed to have. You might be tempted to overdo it – but don’t. It’s not worth the risk and can get very uncomfortable very quickly if you eat the wrong foods, or too much of the right ones, after surgery. In week 3, you might be able take protein shakes about once a day. You might be approved to also eat hummus, steamed or boiled vegetables, soft cereals, scrambled eggs, mashed fruits, steamed fish, ground chicken with stock and soups. Avoid starchy foods like rice, pasta and bread. Vegetables that are fibrous – like broccoli, celery and asparagus – should definitely be avoided. In week 4, your eating regime may begin to allow you to eat some ‘solid’ meals. You can typically begin eating restricted fruits, sweet potatoes, baked potatoes, cereals, fish and chicken. Avoid eating fried foods, lollies, whole milk and nuts – these are not easy to digest. During week 5, you may even have one or two healthy snacks in-between your normal meal times. A hard-boiled egg, hummus, bananas or soft rice crackers might be okay options for you (ask your Surgeon and Nutritionist for details). The most important thing that needs to be kept in mind after Gastric Band surgery is that your meals should be nutrient-dense (nutritionally valuable) as well as remain sparse in calories. You know what that means – good foods, not junk foods! How Long Before I see Weight Loss Results after Gastric Sleeve Surgery? In the months AFTER your surgery, you’ll also have specific eating recommendations from your Surgical team, and you’ll need to monitor your eating regime and portion control. It is often reported that patients can start seeing great results just a few weeks after their gastric surgery procedures. On average, patients might lose around 60% of their pre-surgery weight. What about your skin after Gastric Sleeve surgery – will it bounce back? Gastric sleeve surgery and other bariatric surgeries often leaves you with baggy skin, or Redundant Skin. You can’t exercise skin – it’s over stretched and will only tighten up a bit to a certain point. So the skin, along with any stubborn stores of fat after the major weight is lost, may still end up needing to be surgically removed. Liposuction and tummy tuck surgeries (including Belt Lipectomy Procedures) are also quite common after bariatric surgery procedures. If you need your redundant skin removed, Dr Maxwell offers many various Body Contouring procedures such as Tummy Tucks, Belt Lipectomy and Upper Arm Reduction/Arm Lift and Thigh Reduction surgeries. If after you have adopted your new healthy lifestyle and have done nearly everything you can to see results – and you remain unhappy with the body shape outcome after approximately 18 months to up to 4 years, you might also want to consider Body Contouring and Liposuction options with Specialist Plastic Surgeon Mr Richard Maxwell. Dr Maxwell is a Specialist Plastic Surgeons who focuses on patients who have lost massive amounts of weight via Gastric Sleeve or Gastric Banding procedures. He also helps people who have lost a lot of weight through major life style changes alone (yet not everyone succeeds in overcoming obesity permanently without surgical assistance). He also offers Face Lifts, Tummy Tuck/Abdominoplasty procedures, Breast Lifts, Breast Reductions and Arm Reductions/Thigh Reductions as well as Belt Lipectomy (Circumferential Abdominoplasty) procedures to help bring the body back into its normal contours. If you’ve already lost the weight after gastric surgery or lifestyle changes (or both) and want to reduce redundant skin, phone us today on (03) 8849 1467 to schedule a consultation with Dr Maxwell in Hawthorn or Williamstown. For more information on Bariatric Surgery and Surgeons in Australia who can perform Gastric Sleeve or related Bariatric procedures, visit www.newbodyspecialists.com.au or send us an enquiry form below.